After years at the margins of medical history, the relationshipbetween war and medicine is at last beginning to move centre-stage.The essays in this volume focus on one important aspect of thatrelationship: the practice and development of medicine within thearmed forces from the late nineteenth century through to the endof the Second World War. During this crucial period, medicinecame to occupy an important position in military life, especiallyduring the two world wars when manpower was at a premium.Good medical provisions were vital to the conservation of man-power, protecting servicemen from disease and returning the sickand wounded to duty in the shortest possible time. A detailedknowledge of the serviceman's mind and body enabled the authori-ties to calculate and standardise rations, training and disciplinaryprocedures. Spanning the laboratory and the battlefield, and covering a range ofnational contexts, the essays in this volume provide valuable insightsinto different national styles and priorities. They also examine therelationship between medical personnel and the armed forces as awhole, by looking at such matters as the prevention of disease, thetreatment of psychiatric casualties and the development of medicalscience. 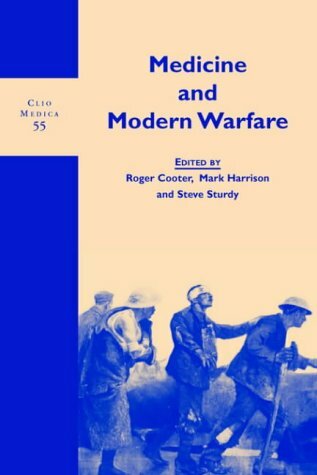 The volume as a whole demonstrates that medicine becamean increasingly important part of military life in the era of modernwarfare, and suggests new avenues and approaches for future study. The Wellcome Series in the History of Medicine provides a regular and active forum for the publication of research into thehistory of medicine and health care in all their branches in various cultures and all time periods.